Battalion Wars​ (aka Totsugeki!! Famicom Wars (突撃! !ファミコンウォーズ) in Japan), originally to be titled Advance Wars: Under Fire, part of Nintendo's Wars series, is a 2005 real-time tactics game for the Nintendo GameCube. 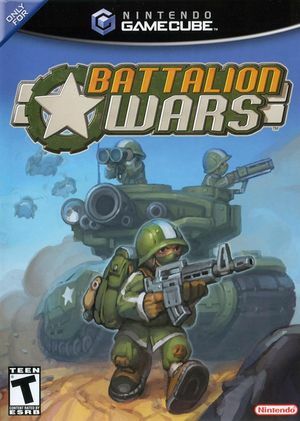 A sequel, Battalion Wars 2, for the Wii, has also been released. Battalion Wars contains the elements of both a third-person shooter and a real-time tactics game. In the midst of battle, the player will have control over a variety of units, including infantry, armored vehicles, and aircraft. Separate units or unit groups can be given commands. Units can be commanded to follow the player, hold their positions, man gun turrets, or attack certain targets. At any time, the player may transfer control from one unit to another. Battalion Wars has a native 16:9 display option, but it requires enabling it in its internal options and setting Dolphin's Aspect Ratio graphics setting to "Auto". Using the widescreen hack with this title is not recommended. Please note the menus and cut-scenes are still displayed in 4:3 with black-bars but in game levels are widescreen. The graph below charts the compatibility with Battalion Wars since Dolphin's 2.0 release, listing revisions only where a compatibility change occurred. This page was last edited on 2 August 2018, at 19:40.